Leading Wholesale Trader of pantry services for office from Chennai. 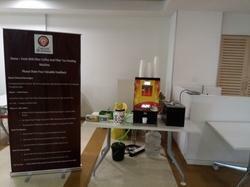 Gemini Coffee Vending India Pvt Ltd is the prominent pantry service provider for office coffee services or pantry service counter with manpower features. Let us start your office pantry service or vending machine solution for you. To commence the office pantry service, You can get us a free of cost demo according to your employee strength. Subsequently, We can deliver and install the fresh milk tea coffee vending machine at your corporate office. Our expert technician will support you by maintaining the vending machine, as well as any mend in a vending machine or replacing machine spare parts will be done. Similarly, we can arrange an extra benefit for your office staff to build the efficiency of their work. Our professional delivery boy and a sales executive will always have a touch with you to get the feedback of our pantry service and for checking a facility to restock your beverage items, cleaning and maintaining your pantry place, and or barter when required.